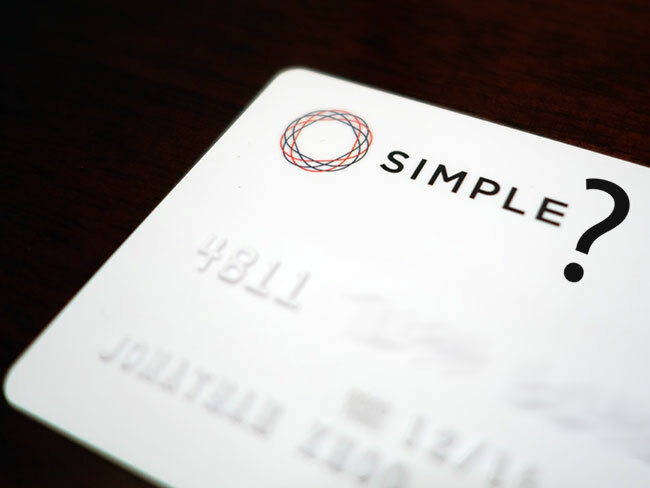 i’ve been with my current bank, Simple, for a well over a year now (i was in one of the early waves of people accepted into the program), and i have really loved it. however, as i’ve discussed before, there are significant usage restrictions when it comes to travel. i was willing to live without having checks (i know, how antiquated! ), a problem surmountable with online transfers and schlepping out to an ATM to withdraw cash, but still, it’s starting to take its toll. but then came the realization that many countries i want to visit are on their blacklist, so the ATM card doesn’t work there. just this past year i’ve had to work around restrictions in Myanmar and in Latvia. clearly i’ve lived to tell, but why add more complication (and fear of being trapped without easy access to money) to your life? Cuba and Iraq, ok, i can see. but South Africa? Eurozone-member Slovenia? to make matters worse, Croatia and Albania are very high on my to-explore list. so, thanks to a comment (thanks @foofiter!) on a Milenomics post on money, i discovered the Schwab Bank High Yield Investor Checking Account. it sounds like you need to be highfalutin to get or use that kind of account, but nope! as far as i can tell, it’s an investment account (that you don’t have to use) that happens to have a checking account attached to it. a free checking account with no monthly fees and no minimum balance. I KNOW! and the best part for international travelers? 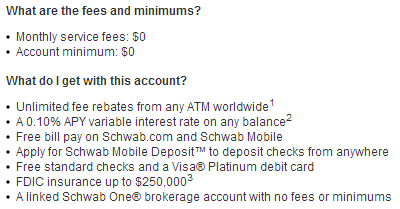 that first bullet point in the second section — unlimited fee reimbursements from any ATM, anywhere. @jonk @JetSetCD @Milenomics I got $22 of ATM rebates on the 1st! the online application process is pretty straightforward, simple questions with an identity verification, but then they drop the ball a bit. the investment account is set up immediately, but you only get an email saying a web login has been set up. there’s a notice on the site that says the checking account will take a couple days to set up but that’s it. no next steps. i did dig up that once the checking account has been created, you can initial fund it by the traditional methods of transferring money or direct deposit or mobile check deposit, or even more traditional, drop the check off at a Schwab branch. i called them up to verify this (since i’m getting a paper check soon) and spoke to a nice gentleman from Phoenix (i didn’t ask, he just said he’s in Phoenix after saying his name). he also told me that my account is now going through the Patriot Act verification process which will take a few days, and then it will be open for funding. once any amount is in there, i will be sent a debit card and checks automatically, no need to request them. update so many things you need to do — but learn from my mistakes and wait until the checking account is created first (it took about 1.5 days for me). in order to transfer money in and out of the account, you need to sign up for their MoneyLink (may have to be logged in) service, which only takes a couple clicks and does that deposit verification thing in your linked account where you have to reply with the small amounts that were deposited. the catch, however, is that it is only partially set up when you do it online, either the inbound or the outbound, not sure which — call them to complete the process. it’s easy. also, you need to go through a one-click application process to do mobile check deposits. once you download the (horribly ugly, i must say) app to your phone, go to “Deposit Check” and apply for this service by clicking the button corresponding to each account. it says it will take 3 days to get approved. update 2 i called in (and i have to say, they are the most knowledgeable bank people i’ve ever spoken with over a telephone) because my mobile check deposit has been sitting there a while, and she told me it’s because for the first 90 days there is an up to 5-day hold on mobile check deposits. also, i gave her some details for upcoming travel so they don’t fraud block me and she confirmed they only block usage in OFAC(?) countries [is this a list?]. also, she reiterated the ATM fee reimbursement program and told me there also is no foreign transaction fee (which is very welcome news to me!). 6 Comments on "I’m Moving to a Better Checking Account for International Travel"
Sounds great – I’m going to have to check it out! i hope it’s as good as people say it is! Thanks for the bump that finally got me to go ahead and sign up for a Schwab account. I’ve been thinking abou this for a while. No sense in waiting. I look forward to using this and avoiding lots of annoying little fees when traveling. yep, i’m in the same boat. i knew there were better options out there and knew about Schwab for about a month now — finally decided to take the plunge. like you said, no sense in waiting! It really is that good. They realistically want you to use the Checking account as a springboard for a brokerage/retirement account, but never pressure you to do so. Straight up free, no hidden fees. In fact you can even stop payment on a check you wrote for free. I deposited a check with the mobile app yesterday and it cleared in 15 minutes. The only thing I’ll say (and it echos Robert’s comments on my original post) is to keep the receipts from your trip, and make sure they credit you properly. They’ve gotten better over the last few years identifying what the fee is on foreign ATMs, but sometimes one will slip through. Most expensive ATM fee I ever had refunded was $8 on a $20 withdrawal. Only did it to see if they’d properly catch the $8 fee, and they did without my calling.